Different strapping materials have different properties in terms of tensile strength, elasticity, elongation recovery, shear, retained tension and stress relaxation. The first consideration is making sure that your strapping is strong enough to withstand the forces to which it will be subjected. This is known as the break load or break strength of the strapping material. The required break load will depend on the total weight and size of the load and the stresses it will be under while transported. Other considerations for strapping selection include temperature variations and the potential for exposure to moisture and corrosives. The most commonly used strapping materials are steel, polyester (PET) and polypropylene (polypro or poly). Each of them has its own strengths, weaknesses and recommended applications. 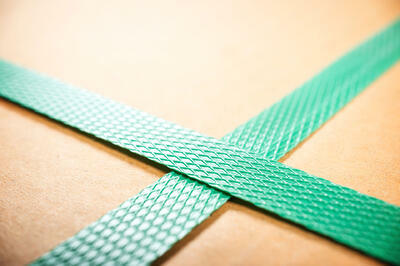 Polypropylene strapping is the lightest and most economical strapping material. It is commonly used for light- to medium-duty applications such as carton closing, paper or newsprint bundling, and bailing or unitizing lightweight materials and products. It is easy to work with, very flexible, and resistant to water and corrosive liquids. It also has a high elongation rating (meaning it's pretty stretchy), which allows it to withstand shocks and move with a load without breaking. Poly strapping is not the best choice for heavier applications, however. Tensile strength for polypro is low compared to other strapping materials, so it won't be able to hold heavy loads during transit. That stretchiness also leads to elongation and deformation over time, meaning that it will lose its ability to hold the load tightly. Extreme temperature changes and exposure to UV light (AKA sunlight) will degrade its performance as well. Poly strapping can be sealed with metal seals, plastic or wire buckles, or by heat seal or friction weld. Steel is still the most commonly used strapping material. With its high tensile strength, it is strong enough to secure even the heaviest loads. Steel strapping is often used to secure materials like logs, construction materials or industrial equipment to flatbed trucks or railcars for cross-country shipping. In addition to its overall strength, steel is highly resistant to changes in temperature and exposure to moisture and UV light, making it great for over-the-road transport and other outdoor applications. Rust resistant coatings further improve moisture resistance. Steel has a low stretch rating, so it will retain good tension on the load over time. However, steel does have its downsides. It is very heavy and can be dangerous to work with; if it does break or is handled improperly during tensioning or removal, it can snap back with enough force to cause serious injuries. It is also more likely to cause damage to products or packaging. Untreated steel may rust and leave stains. Look for wax coated steels for smoother machine feeding, rust resistance and enhanced operator safety. Metal seals should be used with steel strapping. Polyester (PET) strapping has become a popular alternative to steel for all but the very heaviest loads. Pound for pound, PET is stronger than steel, meaning that PET strapping with the same break load will be lighter than its steel strapping equivalent. It is also safer and easier to work with than steel and is resistant to moisture and corrosives. PET is more elastic than steel, so it will provide better tension and package integrity as loads shift and settle. However, like polypropylene, it tends to deform and lose its ability to retain tension over time. Its performance is also degraded by exposure to extreme temperatures or UV light. For loads that will be exposed to the elements for extended periods of time, it may still be better to stick with steel. PET strapping can be secured through heat sealing, friction welding or with metal strapping seals. We can help you find the right strapping material and break load to secure your load! Contact us to talk about strapping selection.